Germany has one of the wealthiest economies on Earth, which is an impressive feat considering its comparatively small size as a country. It owes its economic success to its emphasis on innovation and quality above all else, and its willingness to employ foreign talents to achieve those ends. It is not surprising then that Germany is one of Canada’s top trading partners, with thousands of businesses and individuals taking advantage of its countless opportunities for employment, professional partnership, and its competitive marketplace. As you might expect, personal and business endeavors between Canada and Germany are heavily dependent on documents. These include Certificates of Incorporation, Corporate Power Attorney, Articles of Incorporation, Commercial Invoices, Certificates of Origin, birth certificates, marriage certificates, and divorce certificates. However, using a Canadian document in Germany or a German document in Canada is not so straightforward. German documents that need to be used in Canada will have to go through a process of verification known as an apostille. The apostille process is one of the most common methods of validating documents issued in foreign countries. Canada has not signed the Hague apostille convention like Germany and many other countries and uses an alternative process that is equal to an apostille. This process is known as authentication and legalization, and if you have a Canadian document for use in Germany you will have to go through this process. The first step of authentication takes place at Global Affairs Canada here in Ottawa. Prior to this, your Canadian documents will have to meet their various requirements concerning signatures and translations. Documents received by Global Affairs Canada can take more than 20 business days to authenticate, which easily means over a month of waiting. Once and only once authentication has been completed can your documents be accepted at the Germany consulate for legalization. 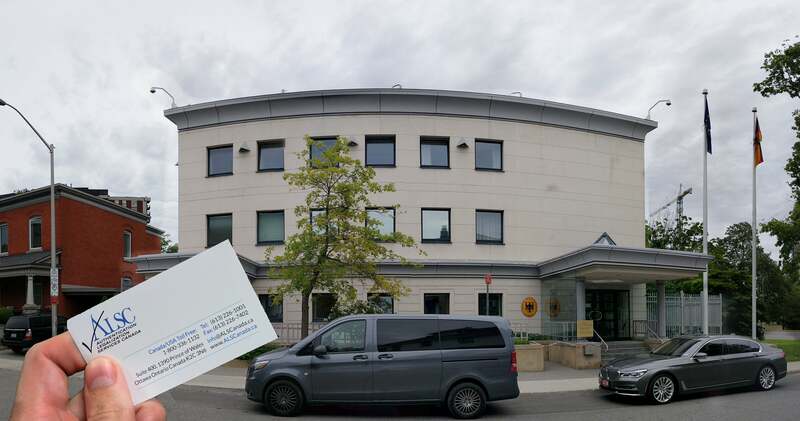 There are German consulates in Ottawa, Montreal, Toronto, and Vancouver, but not all of them offer legalization of Canadian documents for use in Germany. 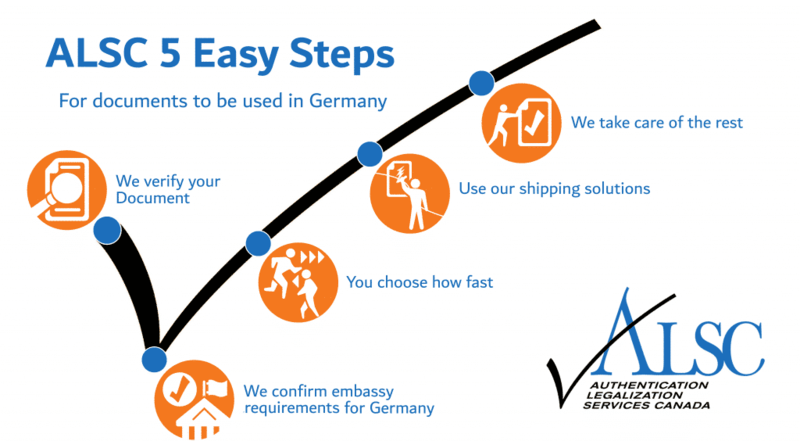 The German consulate has its own requirements and fees which change frequently, as well as their own processing time. This makes it very difficult, if not impossible to successfully legalize your Canadian documents for use in Germany on the first attempt. As you can see, a process that seems simple on paper is very complicated, stressful, and time consuming in practice. Without assistance, authentication and legalization can take months to complete. This is why our service exists. For over 25 years we have been helping people with their Canadian documents for use in Germany and dozens of other countries. As the first in our industry, our service model has become the industry standard. On our priority same day service we can have your documents authenticated as soon as the same day they arrive in our office. Our standard 3 day service balances affordability with speed, and our economy 10 day service allows you to process multiple documents on a budget. Regardless of the speed, by trusting the experts you save lots of time and ensure that there will be no errors. Our strong relationship with the staff at the German consulate in Toronto means we are always up to date on their changing requirements and fees for legalization. Our service guarantee promises that your documents will be valid for use within Germany every time you use ALSC. When you use our services you receive the guidance of a Canadian document expert to answer your questions and address any concerns throughout the process. You will receive detailed updates every step of the way ensuring you are always in the know. Upon completion we can ship your documents anywhere in the world they need to go through one of our many trusted shipping partners. If you have Canadian documents that need to be used in Germany and are rushing to meet a deadline, we recommend you contact us immediately. If you need to use Canadian corporate or personal documents in Germany but do not have them at the current time, refer to the rest of the article on how to acquire them and prepare them for the authentication and legalization process. Germany is a very productive country. It is the spearhead of most automotive, aerospace, and energy industries. Canada’s own expansive aerospace, energy, and automotive industries makes Canada a logical partner to Germany. Every year, hundreds of Canadian businesses are eager to partner with German corporations, expand their existing subsidiaries in Germany, and put their products on German shelves. Regardless of your purposes, if you are looking to do business in Germany your Canadian corporate documents will require authentication and legalization to be valid for use. There is an expansive number of Canadian corporate documents which can be issued and drafted. These include Commercial Invoice, Certificate of Origin, Corporate Power of Attorney, Articles of Incorporation, and Certificate of Incorporation. As an existing corporation, it is likely you will have many of these already in an accessible location or know how to prepare them. The exact documents you will require depends entirely on the requirements of the requesting party as well as any associated processes within Germany which you will have to go through. Before you begin the authentication and legalization process, this something very important to take note of. Although our service guarantees proper authentication and legalization for use in Germany, we are not responsible if you are missing documents or provide the incorrect documents to your requesting party in Germany. As such, we always tell our clients to frequently communicate with their requesting party and clarify which documents and requirements will be needed for their processes in Germany. This is often overlooked and results in unnecessary stress, money, and time. This includes knowing whether original corporate documents are required or if notarized copies of your Canadian corporate documents will suffice for processes in Germany. There are some corporate documents which are difficult or inconvenient to get re-issued if they are lost or damaged. As such, many of our clients choose to have notarized copies made for processing wherever possible. We can do this for you when you use our services. It is important to remember that every corporate document will require the stamp and signature of a Canadian lawyer or notary public to be valid for authentication at Global Affairs Canada, and subsequent legalization at the German consulate in Toronto even if it is an original. We strongly recommend you contact us prior to notarizing your Canadian corporate documents for use in Germany as there may be additional requirements depending on the type of documents you have. If you do not currently have the Canadian corporate documents you need for use in Germany, how you get them will depend on which document they are. If you need a corporate power of attorney, most lawyers have templates which they can draft for you and notarize as well. Alternatively, there are many useful templates which can be found online but will still need to be brought to a lawyer or notary public for notarization once you have completed them. If you need to get Articles of Amendment or Articles of Amalgamation for use in Germany, you will first need to fill our forms to order them. These can be found by clicking here. If you have a Canadian Commercial Invoice or Certificate of Origin, the Canadian Chamber of Commerce has a useful “TradeCert” Certification Made Simple service that can certify these documents for use in Germany. Once you have completed your forms through TradeCert you can send them to us directly via email for processing. Additionally, the Canadian Chamber of Commerce can also sign select corporate documents. Global Affairs Canada recognizes their signatures which makes any documents signed by the Canadian Chamber of Commerce valid for authentication. If you send your documents to the Canadian Chamber of Commerce here in Ottawa to be signed, we can pick them up for you free of charge and begin the authentication and legalization process that same day. Many of our clients have chosen to do this as it can save a lot of processing time. If you are interested in any of these two options, please contact our head office. Again, please make sure you know exactly which Canadian documents you will need authenticated and legalized for use in Germany to ensure you meet your deadline with minimal delays and maximum efficiency. Birth Certificates, Marriage Certificates, and Death Certificates are some examples of Canadian vital statistics documents. These documents are commonly requested for use abroad for purposes of employment, marriage, divorce, and inheritance. Although they are some of the most important documents which can be issued to you in Canada, they are frequently lost or damaged over time since they are rarely used within the country. Luckily, it is very easy to order a replacement from the province which issued your Canadian vital statistics document. These documents are some of the easiest to process for use in Germany, namely because the signatures found on the documents are recognized by Global Affairs Canada. This means that they can be authenticated right away and do not require any additional process such as notarization. Although this is an option, it is not recommended as it is often more expensive to have your document notarized than to simply order a new one from the vital statistics office. If you do choose to have your Canadian vital statistics document notarized, we can do this for you when you use our services. Please keep in mind that as mentioned in the previous section, make sure to clarify whether a notarized copy of your Canadian vital statistics document will be sufficient for the requesting party in Germany. Originals are almost always preferred, as it is easy to see that they are real and therefore valid, whereas notarized copies can occasionally be seen as open to forgery by requesting parties. Another document that may also be requested alongside Canadian vital statistics documents is a divorce certificate. This document is not issued by vital statistics but is instead issued by the court which finalized the divorce. In this case, it is important to know the name of the person at the court who signed your Canadian certificate of divorce. Global Affairs Canada needs to know the name of the signatory, and occasionally it is unclear to tell who signed the document. Contacting the court which issued your divorce certificate before starting the process is highly recommended. Make sure to check your divorce certificate to see if it is properly signed, sealed, and that the signature appears to resemble the name or its initials. When you use our services, we request scans of your documents to ensure they are valid for processing and will assist you in this case. If you need to get your divorce certificate reissued, you will also have to contact the court at which it occurred and have them issue another one for you. If you need a new Canadian birth certificate, marriage certificate, or death certificate, we recommend you have it shipped directly to our office to save you time. Many of our clients choose this option and they are all glad they did. You can order your new Canadian vital statistics documents using the links below. Using Canadian documents in Germany can be very stressful and time consuming. We know firsthand just how complicated it can get which is why we are here to help. It can be intimidating to trust a third party with your confidential documents, especially if this is your first time going through this process. Our proud membership with the Canadian Chamber of Commerce, our countless and growing 5-star reviews on Facebook and Google, and our A+ rating with the BBB are proof that we are trustworthy, reliable, and efficient. Our level of service is recognized not only by Global Affairs Canada but almost every foreign embassy in Ottawa, many across Canada, and even select embassies outside of Canada. We always prepare our documents in the most straightforward and professional manner, never missing the requirements. This makes their jobs easier, which makes our jobs easier, and makes your Canadian documents ready for use in Germany with little to no delays. As the best in our field we are also the most accessible. We have over a dozen service centers across Canada which act as an alternative to the post office. After you make an appointment through our head office, you can drop off your documents at any one of our service centers in Vancouver, Victoria, Surrey, Calgary, Edmonton, Regina, Winnipeg, Toronto, North York, Mississauga, Halifax, or Montreal and have them shipped free of charge by FedEx priority to our head office in Ottawa for processing. Once your Canadian documents have been completed and are ready for use in Germany, they can be shipped back to any one of our service centers across Canada free of charge for pick up. Alternatively, we can ship them anywhere in the world at an additional cost. If you have Canadian documents that need to be used in Germany, don’t take the risk. Save yourself time and money in the long run and trust the experts. We promise one of the most stress free and professional customer service experiences available, at an affordable cost. Click below to get started with ALSC!